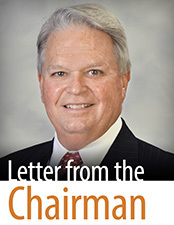 Chairman's Message - West Virginia Mutual Insurance Company / "Physicians Insuring Physicians." "A Great 2018 For WVMIC!" Those of you that are our owners, our insureds/policyholders, will be ecstatic to know that your West Virginia Mutual Insurance Company had superlative financial results during 2018 and that our company is incredibly healthy financially, despite a very few unscrupulous and untruthful insurance agents making claims to the contrary. We were able to declare a $1.5 million dividend for those insured by us on December 2, 2018. As we have stated on many occasions, we at your Mutual strive to return excess premium (profits) to you when it is financially prudent to do so, and Mutual policyholders have received a total of $16.25 million back over the past few years. Even with this dividend, we achieved underwriting profitability, operating profitability, and a combined ratio under 100% (97.1% to be exact, which is almost certainly far better than the vast majority of medical liability insurers nationwide in 2018.) This is incredible performance given that the trend nationally has been for healthcare professional liability companies to have deteriorating results and combined ratios over 100%, sometimes far over, especially in West Virginia. (The “combined ratio” is the amount of money paid out by an insurance company for indemnity and defense costs and other operating costs divided by the amount of premiums and other non-premium revenue, including investment returns.) As we have said on many occasions during risk management seminars, you are in an excellent “pool” of fellow insureds, and that has translated into significantly better claims performance than our competitors in the state over the past several years, particularly this year. Indeed, one of our competitors took a 7% rate increase in our state as of January 1, 2019, and another had to be placed in receivership by the state of Texas, its state of domicile, because of its abysmal claims history and horrible financial performance, which has affected some West Virginia physicians very adversely. To all of you Mutual insureds: please keep up the great work, and we will continue to present our industry-leading risk management programs that encourage top-quality healthcare and help practitioners avoid medical liability pitfall. We are Physicians Insuring Physicians.